2.75" Poker Insert Medals. A great participation award. 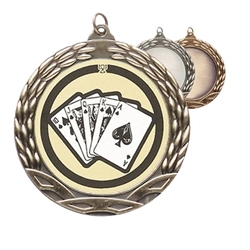 Each poker medal comes attached to a 30" neck ribbon in your choice of color. Free personalization is added to the back. Available in gold, silver, and bronze finishes.